If a slide in your presentation contains a link to an external file (such as a video file, or a chart that is linked to an Excel worksheet) and the external file gets moved or deleted, you’ll get an error message (similar to the one shown below) when you try to edit the data. To fix this, you can either update the broken link, or remove it. On the File tab, click Info, and in the lower right corner, under Related Documents, click Edit Links to Files. Note: If you don't see the Related Document section, make sure you've saved your presentation. 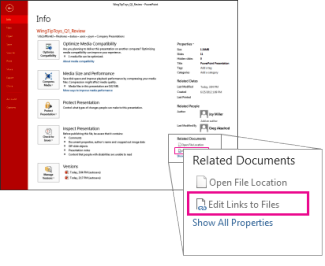 If you know the new location of the linked external file, click Change Source, go to the new location of the external file, and then click Open. 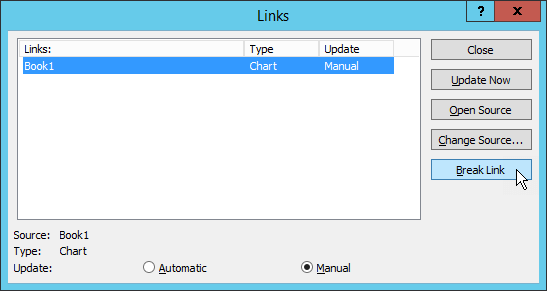 In the Links list, click the correct path to the linked worksheet, and then click Update now. If you don’t know what happened to the external file, click Break Link. The content will still appear in the slide,﻿ but it will be embedded in the presentation instead of linked. In the case of an Excel chart, for instance, the chart data that appears on the slide becomes static when you break the link. If you were to update the original worksheet on which the chart is based, the chart won't be updated as the original worksheet any more. 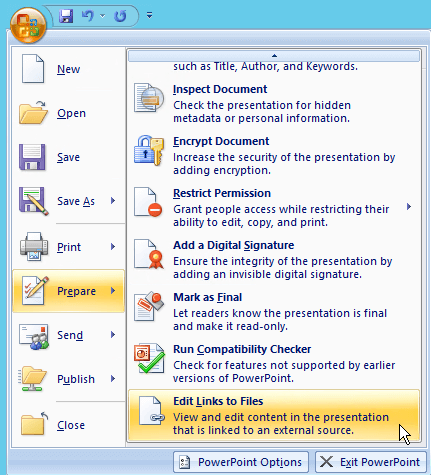 On the Office button, select Prepare, and then select Edit Links to Files at the end of the list of options. If you don't see Edit Links to Files, make sure you've saved your presentation. If you know the new location of the linked workbook, click Change Source, go to the new location of the Excel workbook, and then click Open. In the Links list, click the correct path to the linked worksheet, and then click Update now. If you don’t know what happened to the Excel worksheet, click Break Link. The chart will still appear in the slide,﻿ but the data will not be updated as the original worksheet continues to change.